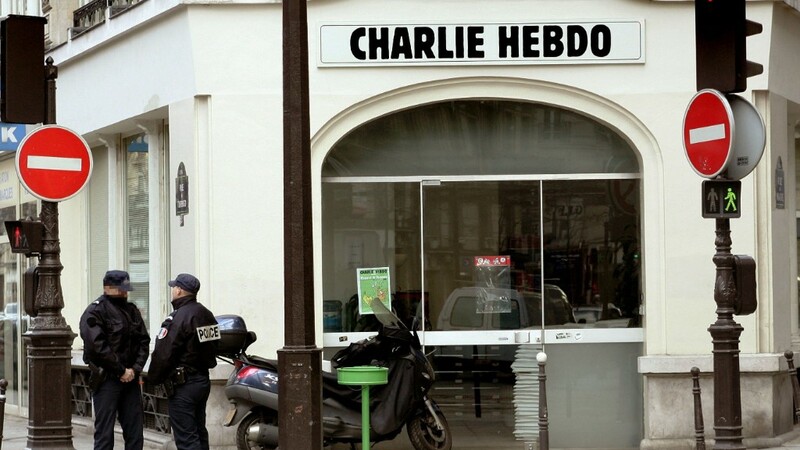 In the wake of Wednesday's killings at the Paris offices of Charlie Hebdo, most major media outlets are choosing not to republish the French magazine's satirical but highly controversial cartoons depicting the Prophet Mohammed. But The Washington Post did choose to show one of the images in Thursday's print edition. "I think seeing the cover will help readers understand what this is all about," editorial page editor Fred Hiatt told The Post's Erik Wemple. Several popular news web sites have also published slide shows of Charlie Hebdo cartoons. Elsewhere, the news instinct to show the cartoons and express support for the slain journalists is countered by concerns about safety and sensitivity. Depictions of Mohammed are a strict taboo within Islam. It's brought forth a fierce debate among journalists. What some are calling sensitivity, others are calling censorship -- an acquiescence to terrorists. There has been widespread speculation that Wednesday's attack was motivated by the publication's criticism of religion. CNN, the owner of this web site, is among the news outlets that has verbally described Charlie Hebdo's cartoons but refrained from showing them. The network has made similar decisions about depictions of Mohammed in the past. In the network's daily editorial meeting on Thursday morning, CNN Worldwide president Jeff Zucker addressed the decision. "Journalistically, every bone says we want to use and should use" the cartoons, Zucker said. But "as managers, protecting and taking care of the safety of our employees around the world is more important right now." On Wednesday, the Associated Press, the world's largest news gathering operation, said it has a "longstanding policy" to "not move deliberately provocative images on the wire," according to a spokesman. This includes depictions of Mohammed. The New York Times, "after careful consideration," also decided that "describing the cartoons" would suffice, according to a spokeswoman. NBC News said Wednesday that the network will not be showing "headlines or cartoons that could be viewed as insensitive or offensive," and that guidance also applies to CNBC and MSNBC. Another major network, ABC News, has taken the same position. A CBS News executive, meanwhile, said the network had implemented no explicit ban on the Mohammed cartoons, but had instructed its producers to exercise judgment. Fox News told Mediaite it has "no plans to air" the Mohammed cartoons, but it did publish them in an online slideshow. News outlets have to consider that many Muslims take offense to cartoons like the ones published by Charlie Hebdo. This is particularly consequential for news organizations with bureaus in the Middle East. There have been sporadic incidents of violence against cartoonists and news outlets in the past. But in the aftermath of the attack, a number of popular news websites decided to show some of the French magazine's provocative covers, including a 2011 image of Mohammed. Among them: BuzzFeed, Business Insider, The Huffington Post, Gawker and The Daily Beast. On Wednesday morning, The Daily Beast updated a slide show it originally published in 2011, featuring 16 of the most "shocking" Charlie Hebdo covers. Daily Beast executive editor Noah Shachtman said there was "zero hesitation" to run the slide show. For one, he said, the images had inherent news value. But the decision to publish the covers was more than that: It was "a show of solidarity." "We're very much on the side of free expression everywhere. And especially in the face of this horrific attack, we want to show that we're with these brave editors, reporters and cartoonists," he said. Shachtman also assailed the Associated Press, calling the news wire "gutless" for not showing the cartoons that featured Mohammed. Gawker editor-in-chief Max Read detailed the magazine's history in a post that included the 2011 Mohammed cover, which is believed to have sparked an attack on the newspaper's offices on the day it was scheduled to come out. He said the decision was a no-brainer. "We ran the cartoons because they're newsworthy," Read told CNNMoney. "If we're going to discuss the controversial images that Charlie has published, we have a duty to our readers to show the images themselves (and to provide context to accompany them)." "Whatever solidarity we end up showing for Charlie is a happy accident of doing our jobs," he added. The Washington Free Beacon, a conservative website, republished "the cartoons that jihadist fanatics don't want you to see" as a salute to Charlie Hebdo. The author of that piece, Lachlan Markay, said the images were a "good way of honoring the slain satirists by ensuring that people see the work for which they literally gave their lives." "We didn't hesitate at all," Markay told CNNMoney. "Our decision seems even more appropriate (and necessary) in light of decisions by some major news organizations to censor or omit images of Charlie Hebdo covers in their writeups. I think those outlets are doing a grave disservice to the very idea of free expression." This issue was brought to the forefront in 2005 after the Danish newspaper Jyllands-Posten ran several caricatures of the prophet. Those cartoons sparked violent protests, and many outlets opted against republishing them. The irreverent animated comedy "South Park" waded into that particular controversy in 2006 with an episode that censored an image of Mohammed. The show's creators Matt Stone and Trey Parker tried to show Mohammed once again in 2010, but were once again denied by Comedy Central.